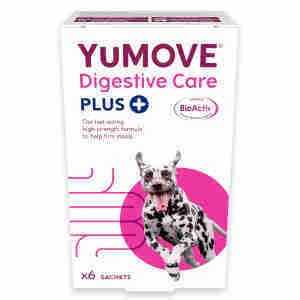 YuDIGEST PLUS for Dogs is developed for serious digestive upsets and ongoing digestive challenges, Yumpro BioActiv Plus provides a veterinary strength complex of prebiotics and beneficial probiotic bacteria, coupled with intestine supporting active ingredients that may help to restore your dog’s digestive health as quickly as possible. YuDIGEST PLUS for Dogs can be mixed with your dog’s food or powder can also be mixed with 10-15ml of warm tap water to form a paste which can be fed directly into the dog’s mouth. Restores The Natural Balance: Our unique blend of 3 different scientifically proven prebiotics and 1 billion probiotic bacteria per sachet support ‘good’ bacteria, and block ‘bad’ bacteria to ensure a healthy digestive balance. Binds Bad Bacteria, Viruses And Toxins: Montmorillonite is a special kind of clay that binds viruses and toxins so they safely pass through your pet’s digestive system. It has been shown to be up to 20 times more effective than other commonly used clays such as Kaolin. Supports The Intestinal Barrier: Threonine is an essential amino acid that helps the cells in the intestine to produce the protective gut lining that’s often lost during digestive upsets. Encourages Healthy Digestion: Linseed meal provides a natural source of fibre rich in lignans and antioxidants to support healthy digestion. The powder can also be mixed with warm tap water to form a paste. To form a smooth paste, add 10-15ml of water. If you prefer to use a syringe, simply mix 20ml of water with the powder to form a liquid. Once mixed with water, the paste should be given to your dog immediately and not stored. My doggie had a tummy issue after antibiotics. He had loose and slimy stool. He lost appetite. His fur was dull. He had stomachache and would not let us to touch his lower abdomen. He sniffed the food and turned his head away. It was unfortunate that he has diebetes. I had to feed him manually for days to keep him survive. Luckily we found this supplement. It worked overnight with normal stool. His appetite returns gradually to normal after three days. His fur shines again. It works excellent! Thank you Yumpro. We have a rescue german shepherd with serious digestive problems and under weight. Yumpro was recomended by a friend.After just 2 days she was doing solid poo's. Brilliant product. Her weight has increased and she is a very happy dog now.I have told another friend about it and she started using it for her rescue dog too with great results. Definitely seemed to help our dog get back to normal after a course of antibiotics she was on for a digestive tract infection.